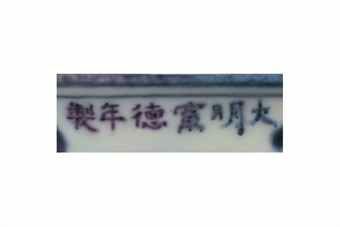 Notes: A Xuande-marked dish of almost identical design and of approximately the same size (72.1 cm. diam.) with a pair of parrots among fruiting peach branches was excavated from Zhushan, Jingdezhen in 1986 and included in the exhibition, Jingdezhen Chutu Yuan Ming Guanyao Ciqi, Yuan and Ming Imperial Porcelain Excavated at Jingdezhen, Yan Huang Art Museum, Beijing, illustrated in the Catalogue, 1999, p. 193, no. 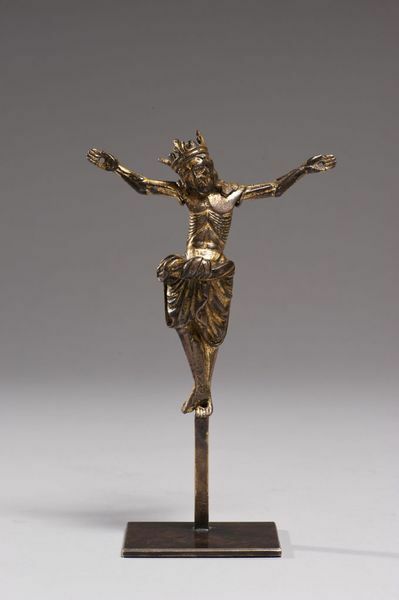 152 (see fig. 1). The painting format also appears on a smaller foliate-rim dish (50.3 cm. diam.) from the Ataka Collection, Osaka, illustrated in Ceramic Art of the World, vol. 14, Ming Dynasty, Shogakukan, Tokyo, 1976, p. 17, no. 10. The bird on the Ataka dish is depicted balancing on a fruiting branch with its beak aimed purposely towards bunches of fruit, it shares the same fluidity of movement as the long-tail birds on the medallion of the present charger. 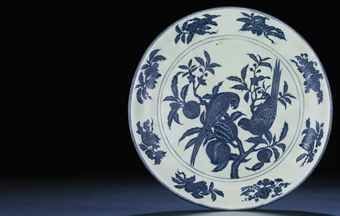 Compare also a Yongle period charger depicting a single bird among lychee branches from the same collection illustrated in The Tsui Museum of Art, Hong Kong, 1991, pl. 63 and cover, which later sold at Christie's Hong Kong, 7 July 2003, lot 643. Compare also a related barbed-rim dish (55 cm. diam.) with two birds on a flowering branch illustrated by R. Krahl, Chinese Ceramics in the Topkapi Saray Museum, Istanbul, Yuan and Ming Dynasty Porcelains, vol. II, London, 1986, p.414, no. 595. 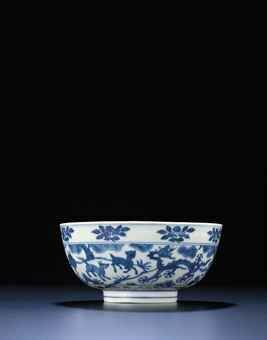 Underglaze-blue chargers of such substantial size are very rare and were probably made to specific commissions. The successful firing of vessels of such massive size is a testimony to the skills of the potters at Jingdezhen. The composition of the 'bird on a branch' theme on the medallion, probably an influence from Song dynasty album fan paintings, is well executed to provide a visually balanced image. For comparable fan paintings of this genre, cf. a fan painting from the Stephen Junkunc III Collection, depicting a pair of magpies on a pipa branch, sold at Christie's New York, 24 March 1998, lot 13; and another of a bird with its body arched towards a bunch of pipa, illustrated in Song Ren Hua Ce, A Record of Paintings from the Song Dynasty, no. 24.